As we approach the end of this parliament and the start of the official election campaign, it’s vital to remember two things about the opinion polls. First, they won’t tell us anything about the result. Not a thing. Don’t read anything into what the polls may suggest about the outcome of the election, and ignore anyone who does. The same goes for anyone who tries to make a story or fashion a headline out of one single opinion poll. Ignore them. There isn’t a story and there certainly isn’t a headline. But that doesn’t mean the polls are in themselves irrelevant. This is my second point. Rather, it’s just they have no relevance in the context of the election result. They have their own story to tell, and it’s a story worth following. Just don’t try and read anything into that story about what may happen on polling day. The Tories are currently on 31.8%; 12 months ago they were on 32.3%. Labour is on 33.2%; a year ago it was on 38%. 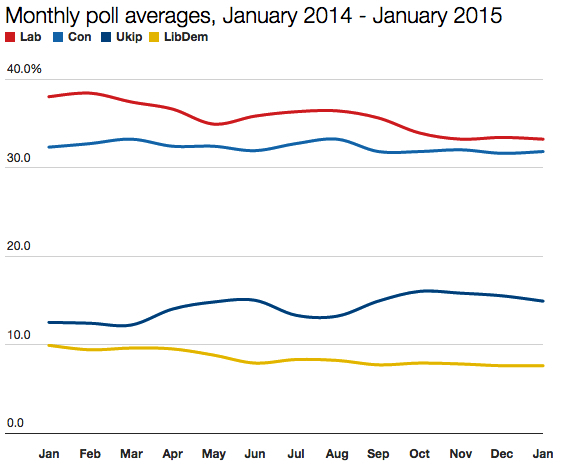 Ukip is on 14.9%, up from 9.9% in January 2014. The Lib Dems are on 7.6%, down from 9.9%. You can make a number of interesting observations about those figures. I’m struck particularly by how the Conservatives are more or less exactly where they were this time last year. The whole of the past 12 months have had next to no impact on the Tories’ poll rating. By contrast, all of the other parties have moved. Labour’s down around five points; Ukip is up around five points. The Lib Dems are still polling their worst rating of the entire parliament. Each of those trends is in itself intriguing, and invites all sorts of questions about polling methodology, the size of samples, the relationship between polls and party morale, and so on. But polls are nationwide snapshots. The general election is not a nationwide contest. It is 650 individual contests, each of which will unfold to its own rules, trends, swings and sensations. Moreover, they will be mutually exclusive contests. What happens in one constituency will be different to what happens in the constituency next door. If we had 650 separate opinion polls being published every week, one in each constituency, then you’d be justified in extrapolating predictions from them about the general election result. But sadly/happily (delete according to preference!) we don’t have those kinds of polls. And so we continue with our twin-track journey to 7 May: one road shaped by polling hysteria and misinformation; one road shaped by polling caution and scepticism. Take your pick! Shouldn’t the graph be Jan 2014 to Jan 2015? You’re right! My head must still be partly in 2014. I’ve changed it now – thanks.